This is the original! Yakityak's iPod cover. If you see this one out and about in "the real world", introduce yourself! You'll be talkin' to me! I got this Alexander Henry print on sale at Joann's in the remnant bin. I thought the circles were marvelously compelling - and evoked the whole click-wheel sensibility of the iPod. The black accents in it worked well with black lining, which I think looks snazzy with the black iPod. 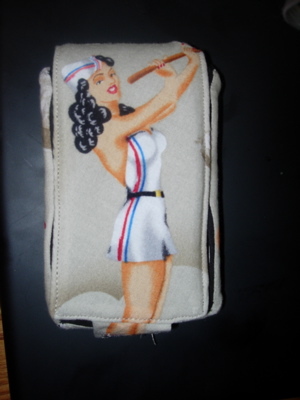 This is Mr. Yak's iPod cover. It came about as a bit of a joke. I told him I'd like to try out the pattern specifically for a 30 GB iPod (mine's 80 gB - is he a nice Mr. Yak or what?!) so I wanted to make him one. I asked what he'd like and he said "The female equivalent of that crazy cowboy fabric." He was talking about the infamous Alexander Henry "Wranglers!" print that was a previous topic of conversation. He didn't actually expect me to follow through, but of course, I did. This is a Robert Kaufman print, purchased at Beverly's and fussy cut since the girls are on the bias. 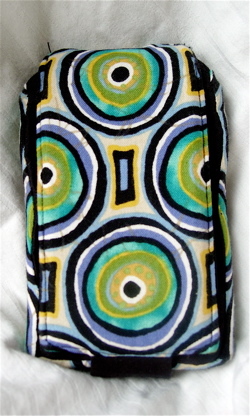 It's the new and improved (well, my sewing quality wasn't but whatever) iPod case! As you can see, this one allows you to plug in a sync cable (or car radio cable) without taking your iPod out of the case. It was a pretty easy modification. The details on how it was done are in the blog. I will also make that blog entry into a pdf so that people can download it. 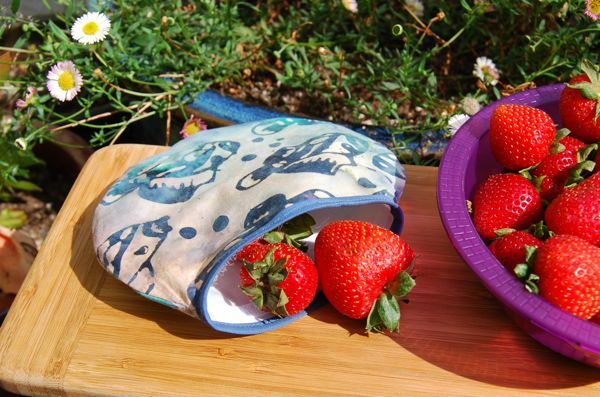 While the modification was easy to understand, it's a bit of fiddly sewing. So I think that unless you have a yen for fiddly sewing, most people will want to put together an iPod case without the slot first, just to get the idea. It takes so little material and so little time that doing a "dry run" without the fiddly bit is not that much extra effort. Anyway, I'm happy with it, despite my lousy sewing. I just hated taking my iPod out of the case every time I wanted to listen to it in the car. Finally here is a photo of a completed Yak Snack Pack, made out of a scrap of batik fabric and white woven PUL. When I make one without a binding I'll pop a picture up of that version, too. 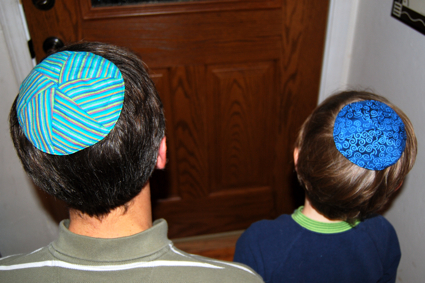 A photo of my 2 favorite boys wearing their kippahs. Both sizes represented.